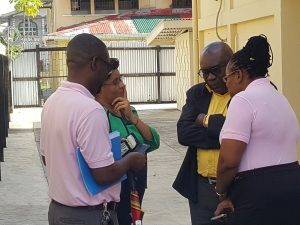 GTU President Mark Lyte, acting Permanent Secretary of the Ministry of Education, Chief Education Officer Marcel Hutson and GTU General Secretary, Coretta Mc Donald chatting in the compound of the Ministry of Social Protections Department of Labour during a short break. Talks for the selection of a Chairman of the Arbitration panel to settle a teachers’ pay dispute broke down on Friday after the Ministry of Education and the Guyana Teachers Union rejected each other’s nominees, union General Secretary Coretta Mc Donald said. Mc Donald told Demerara Waves Online News that the union’s nominees- former Minister of Education, Jeffrey Thomas; former Minister of Foreign Affairs, Rashleigh Jackson and Dr. Aubrey Armstong- were all rejected by the Ministry of Education’s representatives. “One after the other they were rejected and these names were submitted with full bio-data,” she said. Chief Education Officer, Marcel Hutson, she said, could not give a reason for rejecting the names, giving us “the impression that they were just there as pawns to reject names”. Armstrong is remembered for his chairmanship of the public service arbitration tribunal, following a crippling 59-day strike, that had awarded a 31.06 percent increase for 1999 and 26.66 percent for 2000 in contrast to the 4.6 percent offer by government. The GTU General Secretary said her delegation also turned down the Ministry of Education’s nominees for Chairman- Permanent Secretary of the Ministry of Public Telecommunications, Derrick Cummings and Human Resources Manager at the Guyana Revenue Authority (GRA), Glendon Harris “even though we indicated to them before that we would not want to have persons who are presently serving (to be) nominated for chairmanship of the tribunal”. Expressing “disappointment” with the outcome of the meeting under the chairmanship of the Ministry of Social Protection’s Department of Labour, she said the two sides are expected to meet again for the Department of Labour to propose the name of a chairpersons for the tribunal. “We will decide whether we will accept or not accept that name based on the person’s professional background,: she said. There would be no need for the two sides to agree on the two other nominees- one from each side- to make up the three-member panel. Mc Donald accused the Ministry of Education of not being serious about resolving the “entire episode” and were unconcerned about the teachers welfare on whose prospects for improving education standards rests. “If they were, they would have seriously given thought to names that were submitted,” she said. Asked if she thought that the GTU erred by calling off the two-week long strike last week Thursday before reaching agreement on the terms of resumption and the tribunal, she said her union acted in “good faith”. “We thought, on a serious note, that we were dealing with gentlemen and lady but we have come to recognise that when we push and we have always been there as genuine partners, we don’t have genuine partners from the other side,” she said. Mc Donald, following Friday’s 45-minute meeting, assured that “all is not lost, there is still room for things to happen”. The teachers went on strike from August 27 to September 6, 2018 to press demands for a 40 percent increase in salaries for 2016 and five percent annually from 2017 to 2020. After the strike was called off, the union later said it would have settled for 20 percent. Government had offered GY$700 million for 2018 and GY$200 million to adjust some salary scales. President David Granger later said his government wanted to move forward with a new multi-year agreement.